Create and Explore Thousands of Player-Made Villages. When most people say "mobile game," they often refer to an app that challenges your skills and has a winning state of some sort. Block Craft 3D is not that kind of app. This is an app where you can simply sit back, relax and create your little slice of virtual heaven one block at a time. 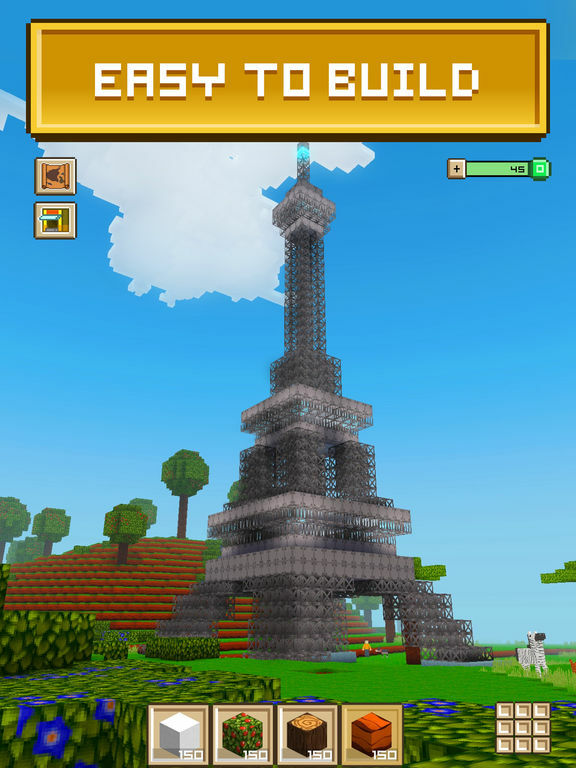 The sky's the limit concerning what you can make in Block Craft 3D. Even then, you just might break through that as well. Collect materials from the environment, including wood, stone, vegetation and so on. Stack blocks wherever you want, as high as you want, in any sort of arrangement you want. Dig into the earth. Make holes, ditches, canals and even underground tunnels. Create houses, roads, forests, castles, and whatever else you can imagine. Make everything you like from scratch, or collect pre-made buildings, both official and fan-made. Share your creations online and explore worlds made by other players. Block Craft 3D is a game that lets everyone recall their younger years, where your imagination can run wild and you can make anything you like from most anything you acquire. If you're starting to feel artistic, then make Block Craft 3D the next big thing on your phone right now. City-builders may be a common sight in the mobile gaming scene, but how many apps out there really let you build a city, village or settlement of your own design from the ground up? How many truly let you run wild with your creativity? The answer is not very many, but the good news is there's now at least one. 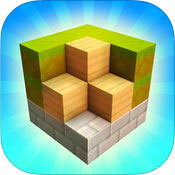 Block Craft 3D is a rare treat that lets you craft your own little world. There's no death or losing state to find here; it's just you, your digital sandbox, and your ability to make whatever you can imagine. Provided you're willing to deal with a few big annoyances along the way. How does Block Craft 3D work? Very simply: it drops you off in an almost empty setting with grassy fields, a few trees, a hill and some simple structures, and lets you build up from there. You do have a few tutorials to go through just to learn the ropes, but from there, it's pretty much all up to you. Using an assortment of blocks in your inventory, all of which are textured to look like different materials like stone, wood and so on, you can make any kind of building you like or rearrange the scenery in whatever way you choose. Building blocks are obtained in two ways: they either replenish over time, or you can take them right out of the environment, just like in Minecraft, which means there's a lot of room for creativity. Want to build a village? Go right ahead. Do you desire a forest instead? Make it happen. Would you like a fully furnished floating torch-lit castle? It can be done. You can even dig holes, canals and tunnels, or create your own hills if you so desire. There is no overarching goal to the game aside from bringing your imagination to life. 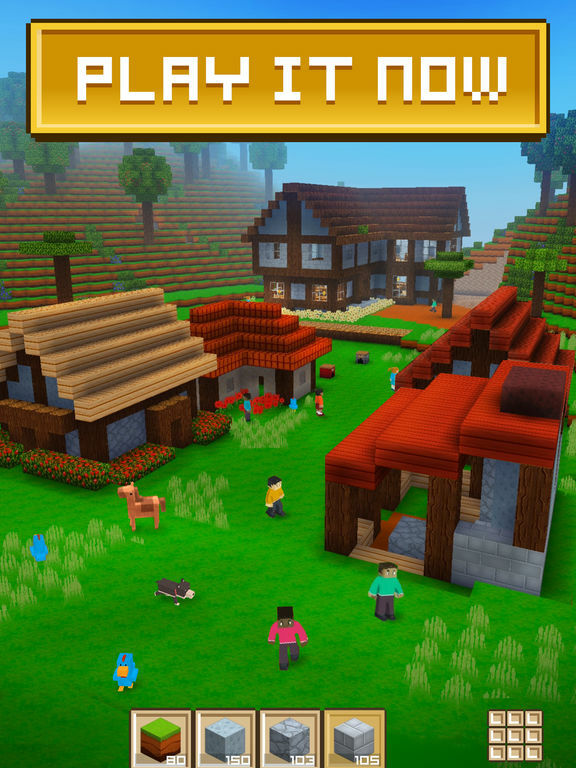 If you were to take a brief glance at Block Craft 3D, you'd probably be forgiven if you thought it was a Minecraft app. It looks nearly identical with its use of cubic blocks to represent everything, from the world to the flora and fauna inhabiting it. The humanoid characters may have a few stylistic differences from Mojang's behemoth, but the resemblance is still there. Even the inventory sprites in the interface looked like they were ripped right out of Minecraft. We've all seen that pixelated sword icon before! While it's certainly a very charming aesthetic that helped give Minecraft its own distinct identity, the cubic art direction in Block Craft 3D is so dreadfully unoriginal that it's a wonder the developers haven't been sued. The game is already aping Minecraft enough as it is; at the very least, it could have tried going for a more unique visual style. Why Does Construction Have to Be So Hard? While what you can create is mostly limited by your imagination, your patience is most likely going to be your biggest obstacle towards creating your dream cubic landscape. Doing so is already a time-consuming affair on a mouse-and-keyboard game like Minecraft, but it's even worse on a touchscreen-operated app. You walk around the place using a digital joystick on the left side of the screen, rotate the camera using the right side, and jump by tapping. It's basic in concept, but the controls feel so floaty and unresponsive that just moving around is a pain. It's even more annoying when you try to build very tall structures that exceed the height of your jump. It's hard to maintain your balance, and one wrong twitch of your thumb could send you tumbling all the way to the ground. You can try easing up on the tedium by unlocking the ability to fly, but that requires you to spend a little extra money first. If you intend to make Block Craft a permanent fixture in your phone or tablet, it might be a worthy investment to make. If you're able to push on through the annoying controls, you might find the app can be very rewarding. That's in large part due to the social tools it provides. Whenever you get bored of fiddling around with your world, you can opt to take a trip to another one and see what other players have accomplished. Not only that, but if you really like some of the buildings other players have made, then you might have the option to purchase and put them in your game. There's a lot of cool stuff to find out there, and a rating system makes it easier to find some of the more quality creations out there. Unfortunately, pre-built stuff included in the app and made by fans alike can be pretty pricey, so you might want to think twice about getting them if you're still pinching your pennies. Block Craft 3D does a lot of things well. The sheer amount of stuff you can build without limit is astounding, and the ability for players to share what they've made with each other is a fantastic feature to include. However, getting to the point where you'll be satisfied by what you've made will be a long and frustrating road. At the very least, Block Craft is worth a glimpse. If you can handle the annoying controls, it should provide you with endless hours of entertainment.